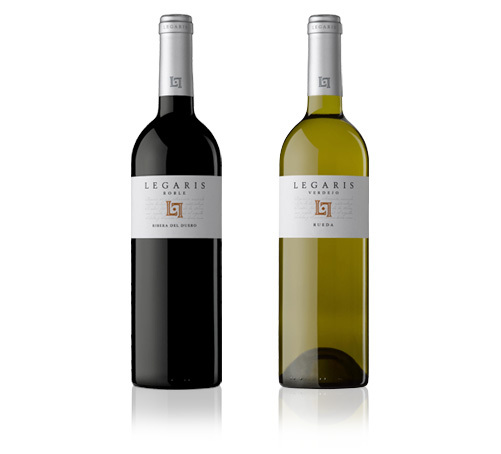 Design of two new young wines under the Legaris brand: a “Roble” red from Ribera de Duero and a white Verdejo de Rueda varietal. The brand already has a Ribera de Duero Crianza and Reserva; the briefing instructions were to maintain the LEGARIS visual identity defined in these two products. Furthermore, the reality was that the graphic structure of the elements present in the current label design offered little margin to introduce variations without modifying brand perception in developing the two new wines. We opted to codify their unique selling point as young wines using two interventions to set them apart from the current Reserva and Crianza wines while maintaining their common affiliation. With the necessary adjustment, the new wines are fully Legaris with a more modern touch that fits with the character of the product. The information provided by the winemakers of Legaris, in the D.O. Ribera del Duero, pointed to the creation of a wine with all the requirements for achieving an iconic status for the winery. Starting by selecting the best grapes from old strains of Tinta Fina, the area’s top variety, always harvested and processed by hand, the entire production process led step by step to obtaining a wine of the highest level. A wine which would only leave the winery as such if the vintage ensured that the quality offered was exceptional. Nevertheless, its most distinctive oenological feature was the fact that it was one of the so-called “free-run” wines. A production system in which the recently-harvested grapes slowly release the must throughout the night, without undergoing the usual pressings. A very slow process by which, breaking the silence of the winery drip by drip during the night, the future wine is progressively created. 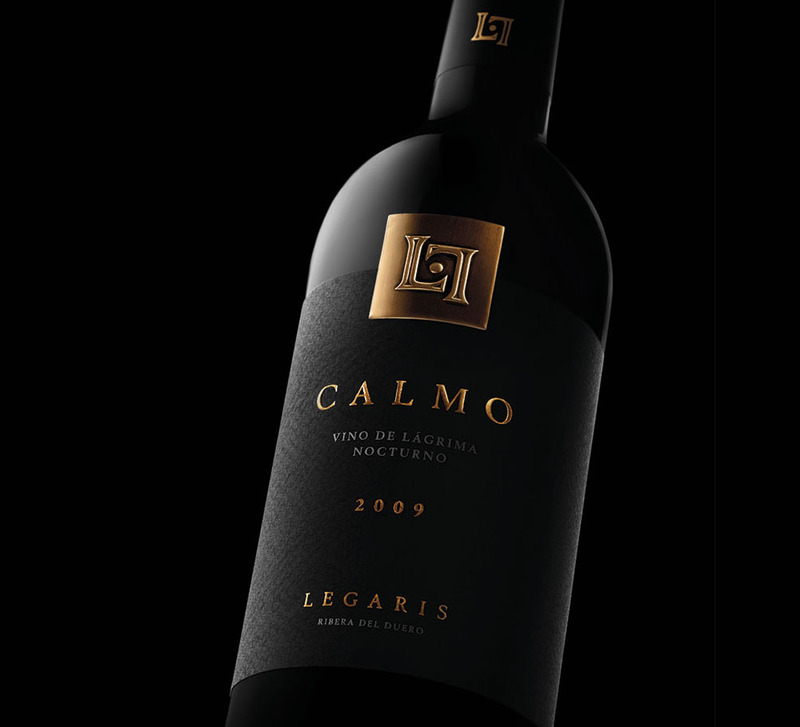 This highly evocative image led us to propose the name that the briefing asked us for: Calmo de Legaris. And it also defined a bottle presence which had to stand out among the other Legaris wines. The description “nocturnal free-run wine” suggested a dark image, in spacious labelling with a rich texture in which the bronze of Legaris is highlighted in the text and in a pewter plaque with the relief of the winery’s symbol.